These headphones can keep up with the non-stop pace of life, thanks to their 15-plus-hour endurance and supreme comfort. If you're privy to a sound signature that favors the midrange and treble, and don't mind paying a premium for a world-renowned brand, then the Bose On-Ear Wireless are an excellent pick. Just like your favorite childhood toy, the Bose SoundLink On-Ear Wireless are mostly plastic. Unlike your favorite childhood toy, these will hold your attention for more than 15 minutes.For some background, Bose is an audio product monolith and quite literally a household name. Journey to any house in my Chicago-suburban hometown and I’d bet my britches that there’s at least one Bose product there. While Bose may be a bit polarizing to those embedded in the audio community, the On-Ear Wireless headphones offer great features such as Active EQ, dual-microphones, and soft ear pads—making these a great all-around package. Generally speaking, these are for anyone upgrading from their phone’s earbuds. As we’ll get into later, they sound great and provide excellent connectivity—something that I unabashedly harp on when it’s sub-par. Unfortunately, the biggest barrier for consumer’s is likely the $179 price tag. 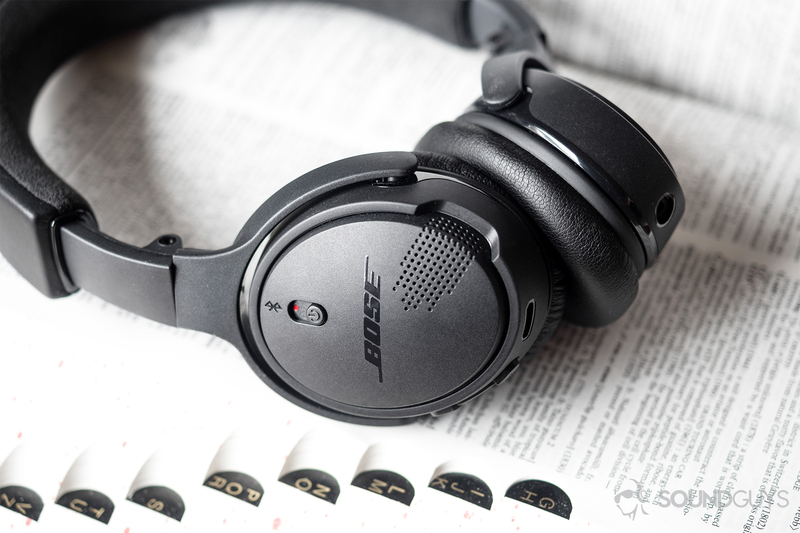 Made from a black plastic, the Bose On-Ear Wireless look classy and timeless, but their attenuated build may be cause for premature breakage. Students: If college debt isn’t inducing night terrors and you have the finances, these are a great investment. Their compact size makes them easy to transport from laconic lecture to dilapidated discussion. Fun fact: being 5.7 ounces, the On-Ear Wireless weigh the same as the recommended serving size of a cooked steak for men ages 20-39 (USDA). Commuters: For the same reason that these are good for students, these are good for the ever-transient. Plus, you can easily swap between devices with multipoint connectivity to aid productivity. The Bose On-Ear Wireless are great for the studious and transient alike, due to their small footprint, pressure-relieving padding, and extended battery life. On the right side of our Bose On-Ear Wireless unit, there is visible superglue in the right hinge, making me question the construction quality that much more. 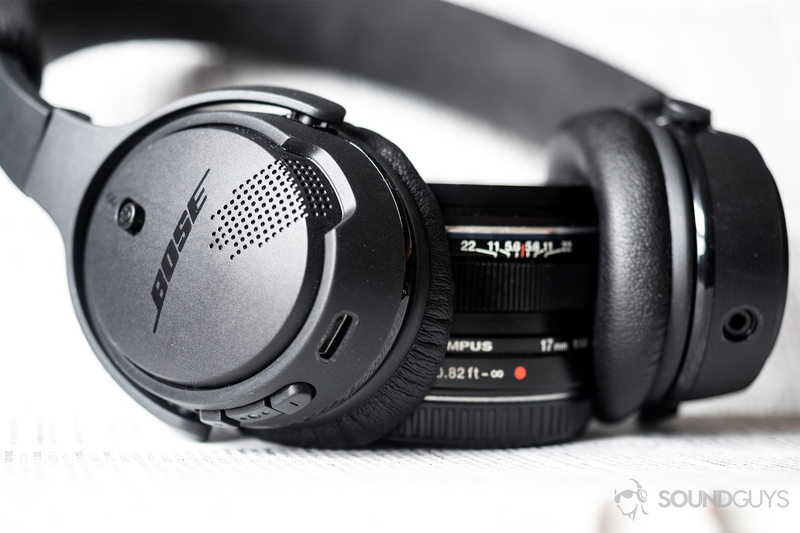 Not to be confused with the Bose SoundLink On-Ear headphones, released in 2014, the Bose SoundLink On-Ear Wireless were released at the end of 2017. Like their predecessor, the ear cups echo the shape of Adam Sandler’s self-described egghead, while retaining a nondescript, signature Bose aesthetic. The raised controls—housed on the right ear cup—are well-built, easy to differentiate by mirroring that of the SoundSport Wireless and SoundSport Free, and respond with the perfect amount of tactile resistance. Plastic construction keeps costs to a minimum, which is okay; though the Bose On-Ear Wireless don’t feel cheap, they don’t feel luxurious either. The plastic yokes rotate in either direction but feel set to snap under minimal torsion. Regardless of the questionable durability, they’re lightweight and uphold Bose’s reputation for being supremely comfortable. Supple, velvety padding keeps the ear cups comfortable and light on the head. Not only are the Bose On-Ear Wireless a pleasure to wear for hours on end—even with glasses—they become even more compact by folding the ear cups up towards the headband, making them the size of a slightly enlarged heart. By just squeezing the headband, it doesn’t feel like it’s going to be comfortable on the crown of the head. Contrary to first-impressions, the headband distributes the On-Ear Wireless’ featherweight mass evenly across the head and on the ears to minimize pressure and maximize enjoyment. Their compact size makes them easy to transport from laconic lecture to dilapidated discussion. The power button is a simple sliding toggle that doubles as a way to initiate pairing. To do so, hold the button up for two seconds. Bose’s voice prompts walk users through the pairing process, making it thoughtlessly simple. Below the power and beneath the diagonally dotted pattern switch is a two-way advanced microphone system. These microphones reduce environmental din while increasing the other speaker’s volume. The system works well in coffee shops, libraries, and outside with minimal wind. Once winds exceed 25mph, you’re better off using Morse code to communicate. It’ll be less frustrating and likely just as effective. Technically, yes, you can workout in them. As a matter of fact, I ran and lifted with these a handful of times, and they’re no worse for the wear. But that was after three easy-to-moderate workouts, so I wouldn’t recommend it. If you’re sweating, the synthetic ear pads transform into a cushy inferno, and since the On-Ear Wireless lack any IP-certification, the perspiration will quickly take a toll on the material. Aside from ruining the ear pads, they’re just clearly not built with athletes in mind. When running, the headband slides around and slips off during horizontal weight-lifting—think: bench press. If you’re looking for workout on-ear headphones, the Plantronics BackBeat 500 FIT are more up your alley. Multipoint connectivity makes it a breeze to connect up to two devices simultaneously. This is great for switching between phone calls and laptop-streamed TV shows. As far as multipoint technology goes, the Bose On-Ear Wireless are some of the most well-equipped Bluetooth headphones available. They flawlessly connect to two devices simultaneously and switching is just a matter of pausing media on the first and playing it on the second. There aren’t any alternating jitters, and while testing, the On-Ear Wireless never disconnected and reconnected in an attempt to switch devices. As long as we’re on the topic of outstanding execution, the Bose On-Ear Wireless provide a superb microphone experience. The aforementioned dual microphones successfully reduce ambient noise and amplify the speaker’s voice. The headphones also make volume adjustments according to your environment. Pretty smart stuff. Just like the Bose SoundLink Color II, Bose omits the explicit specification of compatible Bluetooth codecs. At the ground level, all that matters is this: the Bose On-Ear Wireless are responsive to virtual assistant control and play video without any pesky audio lag. If you want to feel really retro and connect via 3.5mm headphone jack, Bose includes a no-nonsense cable for that too. As far as multipoint technology goes, the Bose On-Ear Wireless are some of the most well-equipped Bluetooth headphones available. For users with multiple Bose products, the Bose Connect app is a great add-on. It allows users to name their headphones, control and switch between multiple Bose devices, and make volume adjustments. The app performs well when it works, but it took three re-installation processes to reach the point where it no longer crashes every other time it’s launched. That said, the most invaluable aspect of the app is that it automatically updates your unit’s firmware, increasing performance stability and potentially the longevity of the headphones. The battery life exceeds expectations by 30 minutes to a full hour, and the LED indicator informs listeners of the battery level. Bose claims that these last for 15 hours, but I have been able to consistently get 16 hours of playback time (volume at 50 percent) before employing my roommates to help scour our apartment for a hilariously commonplace, yet elusive, micro-USB cable. I wish that Bose would pioneer the shift from micro-USB to USB-C charging to expedite the 1.5-hour charging process. In all fairness, this is somewhat made up for by the fact that 15 minutes of charging provides two hours of playback fuel. Plus, if you need a visual indicator of the battery status, the LED glows green, amber, or blinks red to relay high, medium, or low battery, respectively. As a pair of on-ears, The Bose SoundLink On-Ears don’t do a great job at keeping out noise. The Bose SoundLink On-Ears Wireless aren’t flat by any means, but in all fairness they’re not being marketed to audio engineers. The Bose On-Ear Wireless reproduce a consumer-friendly sound that favors the mids and treble over the low-end. This tuning stays fairly consistent no matter the volume, due to Bose’s intelligent Active EQ technology. It’s a subtle feature that prevents the need to fumble around with finicky volume controls, because it’s able to calculate what notes need an appropriate boost. That said, it doesn’t make for a flat sound by any means, but to Bose’s credit, they aren’t marketing to audio engineers here. Located on the right ear cup, the dual microphones do a great job keeping relayed ambient noise to a minimum, while also increasing volume to make it easier to hear the person on the other line. For such a small pair of headphones, the soundstage—or illusion of 3D-space is noteworthy. At the end of New York by St. Vincent, a repeated squish—like wet boots trudging through slushed city streets—drives the fade-out. These final six seconds yield great auditory pleasure, due to the clever production behind New York inter-playing with the Bose On-Ear Wireless’ sound engineering. The lows are pretty quiet with the Bose On-Ear Wireless. To be fair, the enjoyment of prominent mids and treble depends greatly on your music, but it works well in Butterflies by Samsa. This song is an adorable, yet sobering, reflection on a youthful relationship, whereby the speaker recognizes the flaws in his partner is apprehensive about the relationship. The downplayed bass line reinforces the speaker’s prominence in the mix; hence why it’s important for Butterflies that Bose doesn’t overemphasize the low-end. Listeners can follow Samsa on his lyrically-driven introspective journey without being distracted by a booming bass for the sake of “boominess” alone. St. Vincent’s mournful ballad New York conveys longing through Annie Clark’s vocals, and deliberately understated instrumental accompaniment. The Bose On-Ear Wireless sound signature is a good match for this type of work, since the headphones push mids to dominate a given track. The included carrying case is reminiscent of CD carrying cases. Though the retro styling may be polarizing, it’s compact shape is appreciated when using a bag with limited real-estate. Clark’s vocal complexion transcends what we’re accustomed to hearing from pop music, overpowering scream-singing. Clark’s voice remains steady until bridging the verse and chorus; this is where her vocal control shines and is brought out by the On-Ear Wireless’ inclination to overstate the mids. Drive Darling by BOY opens with picking of the A, D, G, and B-strings, which introduces a dissonant tone. Chimes transition the song from verse to chorus, and are slightly overemphasized. This boost meets users’ expectations of “well-defined” highs, making the Bose On-Ear Wireless sound more detailed than their competitors. Tolling chimes transition the song from verse to chorus and are slightly overemphasized. This boost meets users’ expectations of “well-defined” highs. Two-thirds of the way through Drive Darling, a basic “boots-n-cats” beat dominates the instrumental break. Listening even closer, the snare drum complements the Sonja Glass’ urgent guitar picking. The predictable beat anchors the song, allowing for Glass’ complex picking to interweave between Valeska Steiner’s isolated notes. Though the snare is always audible, Valeska’s high-pitched picking is sometimes drowned out by the amplified midrange. By flipping the ear cups toward the headband, the Bose On-Ear Wireless become even more compact and ready to go wherever you are. You’ve made it this far and the $179-question is: are they worth purchasing? Yes… if you listen to lots of vocal-heavy music. The Bose On-Ear Wireless are absolutely worth it for students, commuters, and general consumers simply looking to upgrade their headphones without tumbling down the rabbit hole of audio equipment. These tick off daily listeners’ needs by being travel-friendly, comfortable for extended periods of time, and providing a praise-worthy Bluetooth experience. Of course, the On-Ear Wireless also provide a pleasantly altered sound that brings out the detail of your music’s midrange and treble. Though, these headphones haven’t swayed my preference for around-ear models over on-ear ones, they are hands-down the comfiest pair of on-ear headphones that I’ve tested. I tip my hat to the ease-of-use and hope to see future improvements in the Bose Connect app. If money isn’t an object, then you should buy this object.